There has been quite a backlash and media upheaval since the news of the label changes was released. And rightfully so! I will take you through these changes, tell you whether I agree with them or not and explain where the government did well and where they went totally off-track. What's new with the label changes? The image is a reproduction and is a copy of the version available here. Have you ever noticed that a serving size on a label is totally unrealistic as to what you ACTUALLY eat? Serving sizes are now supposed to more accurately reflect what we eat and be consistent among products so that you can compare “apples to apples” without doing long division at the store. Personally, I don’t think it is hard to find the serving size and calories on the current food label. You can "bold" the calorie content but what will that really do? Calories are not what we should be focusing on. For example, olive oil is high in calories (130 calories for 1 Tbsp) but it’s a healthy fat and calories don’t tell you that. Furthermore, does the average Canadian even know how many calories they should be eating in a day? I really don't think so! In my years of counselling clients I have yet to recommend that anyone look at the amount of vitamin A or vitamin C content in a food to ensure that they are getting enough. Adding potassium is good if you are looking to improve your blood pressure or replace lost electrolytes after an intense sporting event. 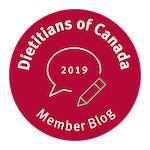 However, I argue that labelling vitamin D may have been just as important for the Canadian population (and it clearly was for the U.S. population as this is mandatory on their new food labels) but that is another argument for another day. Sigh. I am pleased to see the actual amount of calcium, potassium and iron being listed. As a dietitian, I often ask clients to track the amount of calcium in their diets to ensure they are reaching their recommended daily intake. For example, a 30-year-old female wants to make sure she gets 1000 mg of calcium every day. Right now if you look at a container of milk, per 1 cup serving, it will say “30% daily value” beside calcium. What does that mean?! With the changes, the label will say 300 mg. To the average consumer, this can be understood more easily. However, there remains an elephant in the room which is, how much calcium (sub your nutrient of choice) should I be eating? That won’t be on the label. You will have to memorize that from the long and complex DRI tables.... (Get that info here). Or see a dietitian! The labels will state that “5% or less is a little” and “15% or more is a lot” of a nutrient. That will be helpful when evaluating similar products for sodium content, for example. However, despite this guideline, I still think that the % daily value listing isn’t all that helpful – especially if you are a parent trying to navigate healthy food choices for your child because the daily values are based off the average adult intake, not pediatric requirements! 6) Adding a % daily value for TOTAL sugars – Disagree!! First, let me explain the difference between TOTAL Sugars and ADDED Sugars. TOTAL sugar includes naturally occurring sugars (i.e. lactose from milk and fructose from fruit) and sugar which has been added to a product during manufacturing. ADDED sugar (also called FREE sugar) is ONLY what has been added to the product during manufacturing, and is therefore, what we should be labelling. Adding a % daily value for TOTAL sugar is essentially useless. For example, take a naturally sweetened fruit bar made from dates vs. a chocolate covered granola bar. What happens if the naturally sweetened bar made from dates has a higher TOTAL sugar content on the new labels then the chocolate covered granola bar? People may choose the chocolate covered granola bar over the date bar because it has less TOTAL sugar when in fact the healthier choice would have been the date bar that did not have any ADDED sugar. So much for making the healthy choice the easy choice! And Canada has yet to publish guidelines for the intake of added sugar. The World Health Organization (WHO) has set a limit of 12 tsp of ADDED sugar a day (or 10% of your daily calories) for adults. The American Heart Association has recommended a limit of 9 tsp of ADDED sugar a day (36 grams) for men and 6 tsp of ADDED sugar a day (24 grams) for children 2-18 years and women. Children under the age of two should have no added sugar. Instead we have chosen to suggest that adults eat no more than 20% of our daily calories in sugar (approximately 100 grams or 24 teaspoons of sugar a day). I am uncertain as to what the logic behind this recommendation is, except that many people consume far more than 20% of their calories from sugar in a day’s time so anything less would be an improvement. But for everyone else who wants the information necessary to make a healthier choice, we are left to guess, or pull out our smart phones and use the “OneSweetApp” to help us (get it here). The image is a reproduction is a copy of the version available here. One of the main changes to the list of ingredients is that sugar-based ingredients will be grouped together after the name “sugar” to help flag all of the sources of sugars that are added to a food. This is helpful since there are a bazillion ways to say “sugar” and consumers will more clearly see what ingredients are synonymous with sugar. However, without the information on the specific gram amount of ADDED sugars, we are still left in the dark. We are now officially the sluggards and slackers as we fall out of step with our southern friends in the U.S. with respect to labelling added sugars and having guidelines for added sugars. And evidently, these changes can’t be too important for our health, as the Federal Health Minister is giving industry five years to make the changes. In comparison, food companies in the U.S. will have to change their labels by 2018 (or 2019 for smaller businesses). We are now officially the sluggards and slackers as we fall out of step with our southern friends in the U.S. with respect to labelling added sugars. The nuts and bolts: Label changes are a FAIL! If you are looking decrease the amount of added sugar in your diet and want to find out the amount of ADDED sugar in a product, you will have to download “OneSweetApp” to do so. (I review this App in this blog post). If you want to have this information at your fingertips at the point of purchase (where it would be most useful! ), you will have to move to the U.S.
CBC News – Health. Analysis: Sugar’s on the food label, but you’ll have to guess how much has been “added”. By Kelly Crowe. Posted December 16, 2016. Retrieved December 20, 2016 from here. Government of Canada. Food Labelling Changes. Retrieved December 20, 2016 from here. Johnson, R.K., Appel, L.J., Brands M., Howard, B.V., Lefevre, M., Lustig, R.H., Sacks, F., Steffen, L.M., and Wylie-Rosett J. Dietary sugars intake and cardiovascular health: A scientific statement from the American Heart Association. Circulation. 2009;120:1011-1020. Access it here . One Sweet App. Retrieved December 20, 2016 from here. Vos, B. et al. Added sugars and cardiovascular disease risk in children: A scientific statement from the American Heart Association. Circulation. 2016;134:00-00. Access it here. World Health Organization. Sugars intake for adults and children: guideline. Retrieved December 20, 2016 from here.